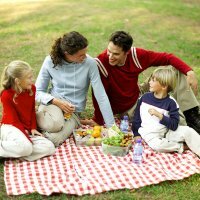 Finding homeschool schedules to work for your family. 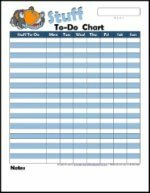 Here we have 5 Unique Printable Homeschool Charts to help you stay organized!! Recently our children started back to school from the Christmas holidays. I use a schedule for all 7 of them. "I want you up, dressed, your bed made, and your breakfast eaten, teeth brushed, and I want you to present yourself with your pencil by 7:45 at your desk with your Bible and Journal open!!" 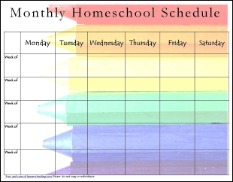 Looking at sample homeschooling schedules is a great way to come up with ideas for your own, but at some point you need to create YOUR family schedule and implement it! A traditional school year is 36 weeks, 180 days. Some elementary curriculum has the lessons numbers at the bottom of each work text page. For example: a book with 300 pages divided by 180 days of school would be around 1 ½ pages a day. Assign these pages...enter in the child's daily, weekly, or monthly schedule. (scroll down for free printables). 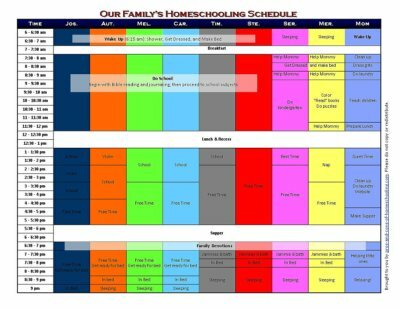 Take your homeschooling schedule like our family's example here... and place it in a Master Family Schedule Chart. At a glance, each member of the family can see what they are supposed to be doing. 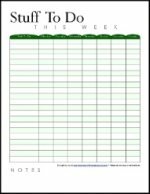 Then create your family schedule using these homeschool schedule guidelines. Many of my children work independently. With 9 children, One of my biggest problems was keeping up with what every child had finished each day for school. I was getting confused with who had shown me what or if one child had not finished his assignment. These chart were created out of that frustration!! Place Every task that you want your child to do every day on this chart. 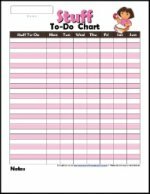 As the child finishes each task, Mom or Dad signs the list or it is checked off and the child continues on to the next task on the chart. I even do this for my high school children. With the added responsibilities of more school work/projects, keeping up with what they are doing is even more important. Laminating this chart can save you on printing a new one every week. A reward is given at the end of the week for a perfectly completed “Stuff to do” Chart! List all the assignments you want the child to finish for the day. It keeps them on track and you more organized!! My high school students write down an entire weeks assignment and stay organized for the week. Tests, quizzes, homework, and reading assignments can be seen at a glance! Write down all assignments, lesson plans, test, quizzes, papers, days off... for a entire month with this schedule. Homeschoolers generally have a lot of freedom in setting up their schedules, and it sometimes takes a while to find out what works best for the family. 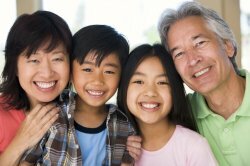 It's helpful to read what other family schedules look like...read or write yours!